Clay bar process: just what is the real deal? Is the clay bar really going to scratch your paint? Asking about the clay bar process will get you almost as many opinions as there are people. Just like any other area of the auto detailing world of products, the answer will usually be based on an someone's agenda. My experience has shown that typically a company will highlight the benefits and skip over any drawbacks of this detailing clay process. I remember when these products first came out there used to be disclaimers on the packaging stating how a certain amount of scratching will be done when using the clay bar. I have checked all the retail clay bar products and have yet to come across any that still offer up this product warning. Are we to believe that these bars are no longer scratching the paint on our cars? "So Darren, if you are telling us that the clay bar process and detailing clay scratches my car paint, why the heck would I ever use it?" The air is full of mostly invisible contaminants; we will refer to this as pollution. This pollution will attach to your cars paint. This will create a texture on your paint that can be felt. This "pollution" can also be seen as what looks like tiny rust specs on light colored cars. You use the clay bar by rubbing it back and forth over your paint until contaminates are removed.It is used with some form of liquid lubricant that allows the clay bar to glide across the paint. This is how you prepare the surface of your car paint after washing, and prior to any polishing or waxing. "So Darren, what kind of pollution or contaminants is the clay bar process effective for?" Airborne pollution and contaminants come in many forms. 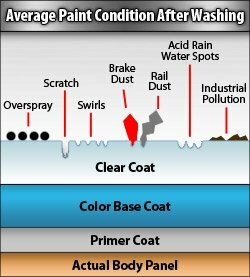 While the air we breather is full of many microscopic pollutants that also attach to your cars paint, there are many other assaults to your car's paint that are reason for concern that can be dealt with using detailing clay as part of the surface preparation process. Brake dust from your own brakes. Rail dust from your car being transported by rail from the factory. The diagram above shows a cut-out side view of the different layers to a typical paint job. Notice all the contaminants that sit atop the paints surface; these are the elements that will be removed by using the clay bar. You might also notice that the rail dust and brake dust are embedded into the paint itself. This is where there are varying explanations as to the exact process of the clay bar. The bar shears off any form of contaminants that are above the surface level of your car paint. The clay bar "pulls" any contaminants from your paints surface. Does the Clay Bar Process Work: yES! The accepted method for removing paint contaminants by professionals like myself. Simply works regardless of your opinion. The only way for truly silky smooth car paint. "Darren, you still haven't addressed the issue of whether the clay bar scratches my car paint or not!" 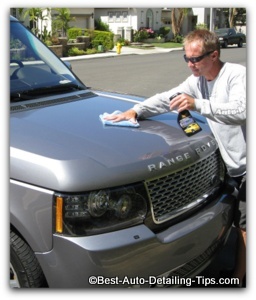 Many people ignorantly come to the conclusion that If the clay bar scratches their car paint, why should they use it. They think they would rather just have the many types of pollution on their car paint rather than having it scratched up by using the clay bar. Not All Scratches are Created Equal: The more correct label would be to say that the clay bar will mar or abrade the surface of your car paint; not scratch it. This superficial marring or abrading is so light that simply waxing your car by hand or with a car polisher will remove any superficial "scratches" put into your car paint by using the clay bar. If you want to take it to the next level after using the clay bar on your car paint, car polishing tricks for beginners will be the place to go. The Only Way for Silky Smooth Paint: Unless you have experienced the finished results of a car that has been clayed and waxed, it is hard to imagine just how amazing your car paint can feel. Once you have experienced, I promise you will be happy as a clam and will never go back! "O.K. Darren I get it. I want to experience the benefits of using detailing clay on my car; what do you recommend?" If you are e beginner which you likely are otherwise you would not be at this page in the first place, I recommend shopping one of the many clay bar kits available. I am a big fan of kits as a general rule as you generally get more for your money and you get to try different things you might normally not be willing to try if you were left to buy them individually. So use this link to see my recommendations regarding clay bar kits and shop from among those. Unless you have experienced the clay bar in action, you don't understand just how amazing car paint can feel that has been freshly clayed and waxed! Every car will need to be clayed eventually if not immediately. Even cars brand new off the dealer lot will have some level of pollution already sitting on the cars paint surface. Car paint should feel silky smooth when clayed and waxed. If you have a dark colored car, I strongly recommend you get the micro-fiber polishing kit from Meguiar's that will deliver professional grade results that any true beginner can do. You will truly impress yourself with the results you will be able to produce with a quality clay bar kit, polishing system, and a quality car wax.